Montreal's infamous "ugly" Christmas tree of 2016 — one that generated headlines and social media posts around the world because of its awkward appearance — is the inspiration behind an entire village this holiday season. Montreal's infamous ugly Christmas tree of 2016 — one that generated headlines and social media posts around the world because of its awkward appearance — is the inspiration behind an entire village this holiday season. A new "ugly" tree is being unveiled this Friday as part of the Village du Vilain Sapin, an installation to be erected near downtown to celebrate imperfections. The group responsible for finding last year's tree is also behind the new village, constructed around another authentic, albeit much smaller tree at about 20 metres high. "It's a bit of a nod to last year's tree," said Philippe Pelletier. 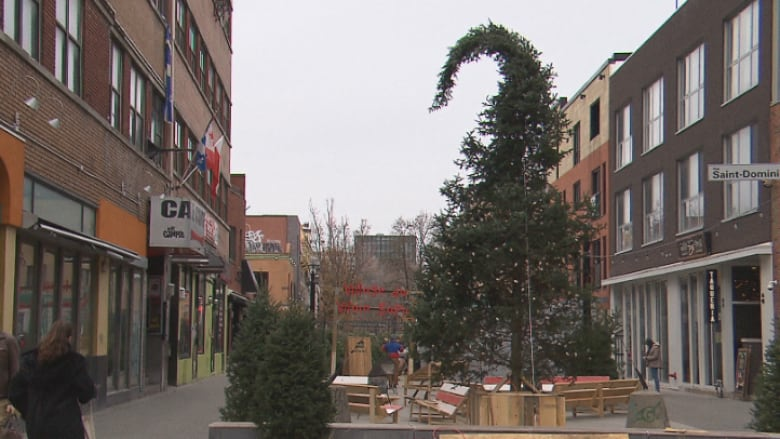 "It could become a Montreal tradition — instead of having a magnificent, perfect tree every year, you have one that's authentic, crooked, a little bizarre with personality that could be super original and a mark of distinction for Montreal." Last year's tree became a social media hit and garnered stories in major publications ranging from the New York Times and Washington Post to People Magazine — for all the wrong reasons. Described as "ugly," "skinny" and "lopsided," the nearly 27-metre high tree was derided for much of its existence and ultimately dispatched to the sawmill just after Christmas. Pelletier's group had hoped to find a tree last year that would rival the one at Rockefeller Center in New York City, using it as a springboard for Montreal's 375th birthday this year. But the balsam fir they plucked from the Eastern Townships fell a little short both in size and stature. Pelletier said they took the negative coverage in stride. "It's an initiative we undertook ... and we never thought a huge international controversy would have revolved around the aestheticism of a tree," said Pelletier. "It was only a question of appearance and we found the virulent reaction of Montrealers and around the world very surprising." Pelletier said only $2,500 in public money went to the sparsely decorated tree — and that, thanks to a sponsor. Some liked its less than perfect nature, while others were less generous, calling it "embarrassing" and "hideous." "Looks like the city of Montreal subcontracted its Christmas tree to Charlie Brown," quipped one Twitter user last year. The scrawny tree even ended up with its own parody Twitter account. Pelletier defended it as what a big, natural Christmas tree from Quebec looks like. He added nobody on his team was hurt by the social media lambasting. "No one took it seriously, nobody's ego was bruised because of the reactions," Pelletier said. This year, the location of last year's tree will be used for two other trees. 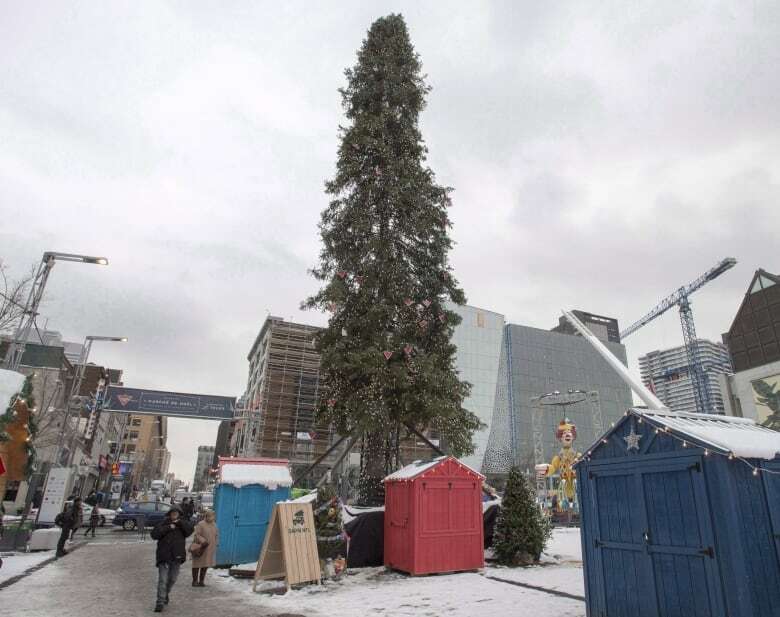 Organizers of Montreal's Grand Christmas Market say Cœur de plume by sculptor Jean-Robert Drouillard and what's described as the smallest tree in the world by artist Valerie Dupras are to be unveiled Dec. 1.